photo-eye | BLOG: Book Review: Cubic Feet/Sec. Book Review Cubic Feet/Sec. By Andrew Phelps Reviewed by Karen Jenkins Over a thirty-four year period beginning in 1979, Andrew Phelps, his father and assorted friends took nine trips together through the Grand Canyon, rafting along the Colorado River. A camera was essential gear on each journey; beginning with eleven-year old Andrew’s Kodak Instamatic 110, replaced through the years by other formats, all taken up in a desire to share the adventure. 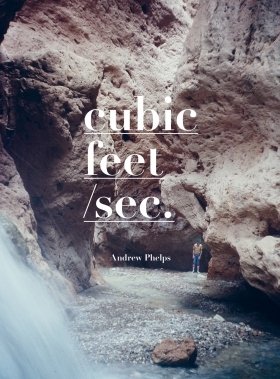 Cubic Feet/Sec.. By Andrew Phelps. Fotohof, Salzburg, Austria, 2015. In English. 112 pp., 60 illustrations, 7x9". Over a thirty-four year period beginning in 1979, Andrew Phelps, his father and assorted friends took nine trips together through the Grand Canyon, rafting along the Colorado River. A camera was essential gear on each journey; beginning with eleven-year old Andrew’s Kodak Instamatic 110, replaced through the years by other formats, all taken up in a desire to share the adventure. Yet the slide shows expectantly culled from each trip’s exposures fell short, as Phelps found himself disappointed by the photographs’ inability to faithfully conjure his experiences for his armchair travelers back home. Now, a few years after the final trip has ended, he’s thought back over these journeys and combed through their multitudinous photographs, in a reexamination of failure. This time around, Phelps rejects the singular in favor of the collective, and draws photographs from each trip’s cache, made by himself, his father and others. The reimagined adventure of Cubic Feet/Sec. collapses time and disregards contiguousness and even authorship in favor of crafting one last, essential show that finally gets the story right. Cubic Feet/Sec.. By Andrew Phelps. Fotohof, 2015. The big themes of Phelps’ story emerge easily and effortlessly draw you in. With his savvy as a now mature photographer and curator, he taps into that quality of vernacular photography that feels somewhat unrooted from a temporal context and populated by representative types — father and son, guide and explorer. Phelps and his fellow cast members are often shot from a distance, small in the epic landscape of canyon and river. The figures may be put in their (relative) place, but they do insistently belong — one shot is all shadowy silhouettes of each adventurer, dark against a bright rock face, embedded in its surface and integral to the scene. Phelps also comes in close; including many in-the-moment scenes of himself and others taking in the details and the simple pleasures of leaping off a ledge or cooling off under a waterfall. Yet belonging is not staying the same, and if part of the story draws on the idea of immutable forms and forces, Phelps’ tale doesn’t entirely camouflage the inevitable change. Within these images, he and his father grow older. A young boy matures, and his bearded dad also evolves through each iteration of the trip (despite the near-constancy of his cut-off jeans).